If you enjoy tasty food, this is an ideal stop off point. The Food Truck Alley on Dickson Street offers a welcoming environment for families. Whether you fancy trying some pizza or ice cream, these trucks can cater to all tastes. This part of the city is a favorite with locals, and always has something going on. Situated in the city center, Wilson Park is the oldest park in Fayetteville. It provides a picturesque urban area for locals to relax in. 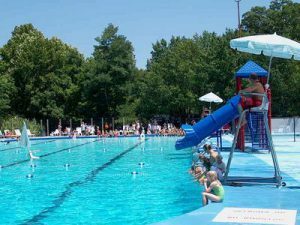 Founded in 1906 and encompassing 22.75 acres, this park has a variety of amenities, such as tennis courts, a swimming pool, a basketball court and a softball field. A playground, castle area and swings are perfect for kids, while picnic areas and green lawns are ideal for a family day out. If you are visiting in the fall, spring, or summer, this is not to be missed. The market is held in Fayetteville Square and features local artists, farmers, music and coffee shops. There is a lovely community spirit at these events, which offer the perfect opportunity for some photos. The Arkansas Military and Air Museum depicts Arkansas’ fascinating history of aviation, through a splendid collection of aviation artifacts, memorabilia and historical treasures linked to aviation. In the museum, there are both mobile and static displays and exhibits. Lots of these are still used today. Marvel at the huge wooden hangar that used to be an aviator training post in World War Two, and stroll through the impressive aircraft displays that feature a Stinson S Junior, a Douglass A 4 Skyhawk, and military helicopters from the Vietnam era. The Mount Sequoyah Cross offers a lovely view of Fayetteville, particularly at sunset. It is the ideal place to escape to and enjoy some quality time by yourself, or with loved ones. Feel free to climb the cross base to take that daring selfie, just bear in mind that it is a bit precarious. Finally, the Ozarks Botanical Garden boasts an extensive range of themed gardens, as well as a charming butterfly house. In 1994, the gardens were set up with the intention of offering a stunning location for leisure and relaxation. Also, the garden aims to be a source of learning for both adults and children, and encourages people to become interested in the Ozarks’ natural ecosystem. A range of educational workshops, programs and lessons on conservation and horticulture are provided to children of every age, along with practical science and nature learning events – like Butterfly Days, Firefly Fling and Earth Day.